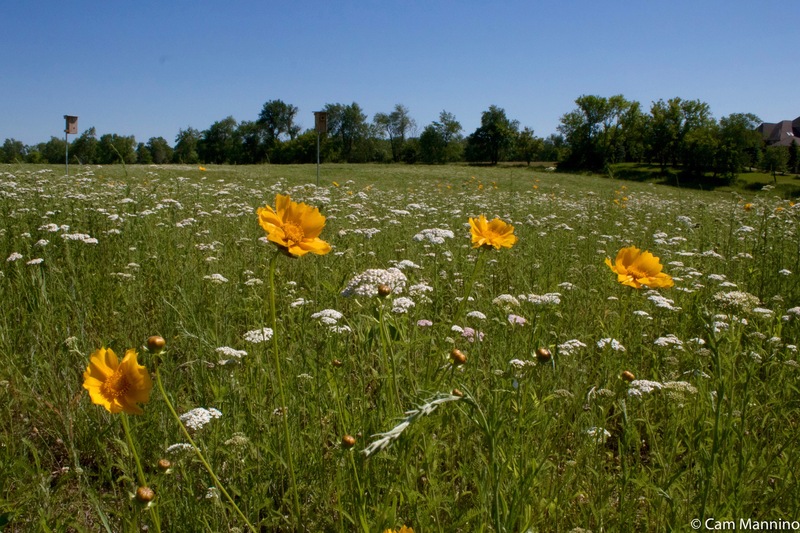 Draper Twin Lake Park: The Restored Prairie is A-buzz, A-flutter and Blooming! Early summer is blooming and buzzing at Draper Twin Lake Park. The golden petals of Sand Coreopsis (Coreopsis lanceolata) ruffle in the wind among dancing white Ox-eye Daisies (Leucanthemum vulgare) and Yarrow (Achillea millefolium). What a sight for a summer afternoon! Birds suddenly burst from the deep grass or sway on a sturdy plant stem while being tossed by the wind. Butterflies settle in sunny spots along the moist trails near the marsh or dance along a sunny prairie trail seemingly unable to choose which early summer bloom might please them. Such summery abundance after a cold spring! Butterflies Take to the Air! and apart as the wind blows them this way and that. The male took a brief rest to sip some nectar as the female flew away. But the wind was so strong that he only paused for a few brief moments before he was blown off his flower! The male Tiger Swallowtail took a breather for a few moments. But the wind caught him and shoved him off his blossom! Undeterred, he fed on a bit more nectar and was soon back in the sky, dancing off above the treetops with his female companion. Nearby, a flash of orange and black made me think I was seeing a Monarch Butterfly (Danaus plexippus) among the greenery. But no! The bars at the bottom of its hindwings were the unmistakable insignia of a Viceroy Butterfly (Limenitis archippus). 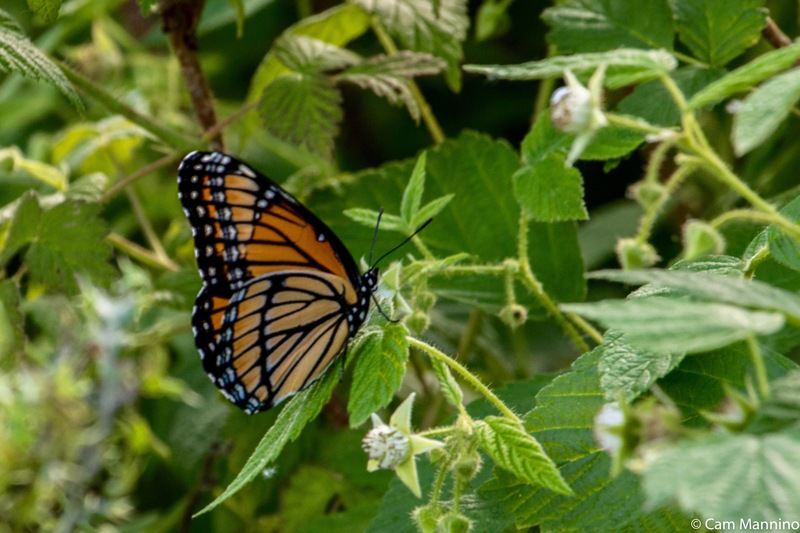 By mimicking the Monarch’s appearance, the Viceroy warns predators that he’s distasteful too. Viceroys are “Müellerian” mimics, meaning they mimic the color and pattern of Monarchs which, like them, are distasteful to predators. By mimicking each other’s appearance, they give potential attackers a warning. “If you see something that looks like us, stay away or you’ll be sorry!” Isn’t evolution amazing? 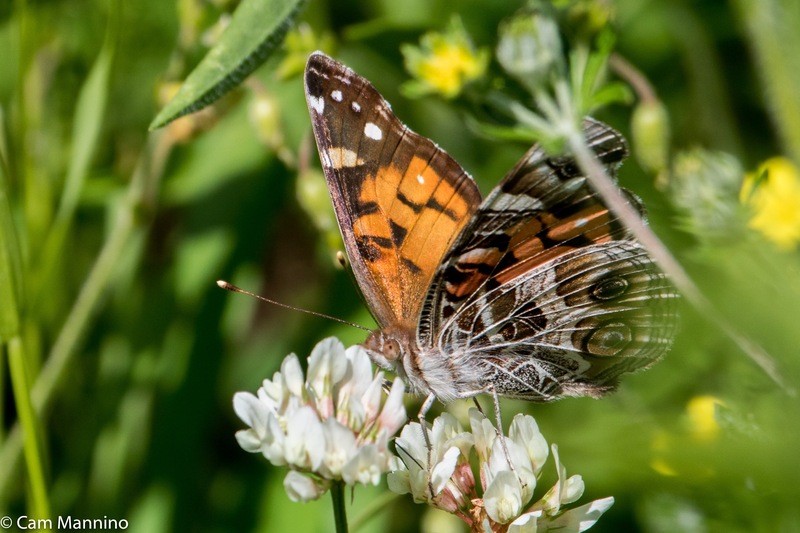 In the grass along an eastern path sat one of the smaller butterflies much loved by generations who raised them in their classrooms or released them for special events, our very own American Painted Lady (Vanessa virginiensis). The two large eye-spots on the underside (ventral) of its hindwing distinguishes it from the Painted Lady (Vanessa cardui) which has four smaller eyespots in the same place and is widespread, appearing on every continent except Antarctica and South America. Two large eyespots on the underside (ventral) of the hindwing means this is an American Painted Lady rather than the globally widespread Painted Lady. Summer truly begins for me when damselflies settle delicately on shady leaves and dragonflies patrol prairies or ponds in search of a mate. 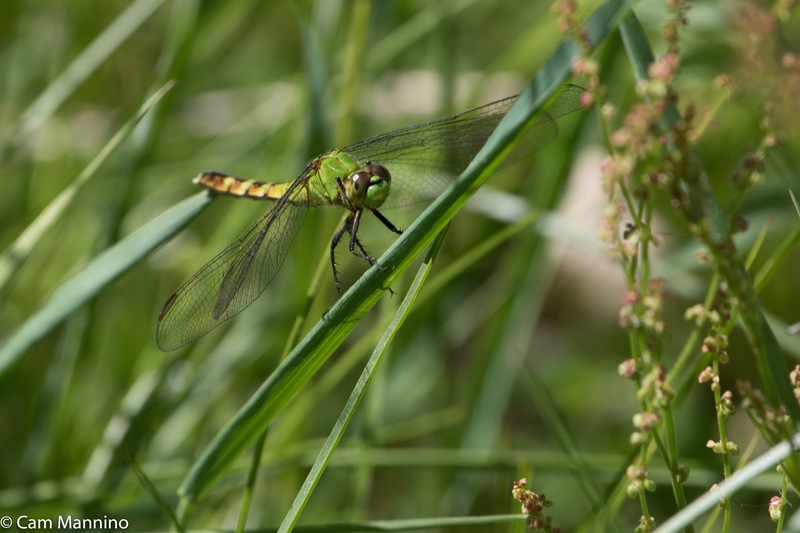 The Common Whitetail Dragonflies are out in force right now near Twin Lake and the wetlands. The female Eastern Pondhawk (Erythemis simplicicollis) below was hunting away from the water. She waits on vegetation until prey comes sailing by. After about two weeks, she will approach water to find a mate and choose an area of the pond in which to lay her eggs. Within one minute of mating, she will start dipping her abdomen into the water to release eggs, while the male hovers nearby. This female Eastern Pondhawk will soon be choosing a male. His abdomen is blue, his thorax is green & blue and his head is green. Damselflies (in the order Odonata like dragonflies) look like delicate flying sticks. Many are iridescent or sport elaborate patterns on their abdomen and/or thorax. They are ancient creatures dating back to the early Permian, at least 250,000 years ago, and live on every continent but Antarctica. 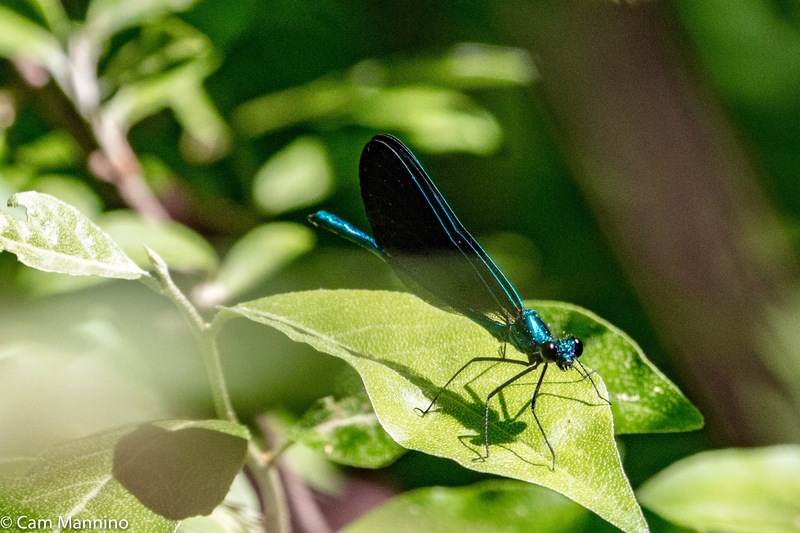 As part of the courtship ritual, the male Ebony Jewelwing (Calopteryx maculata) damselfly bobs up, down and around with other males in what are called “flights of attrition,” until his opponents become exhausted and leave – or he does! The male Ebony Jewelwing damselfly on the hunt. Love how his body shows through those translucent wings! I’d forgotten that the brown and black damselfly below left was a female Violet Dancer (Argia fumipennis violacea) until I got assistance at the Odonata of the Eastern U.S. Facebook page. The male is a much more glamorous purple and blue. I saw the female this week at Draper Twin Lake Park and the male there three years ago. The female Violet Dancer is a modest brown and black damselfly. 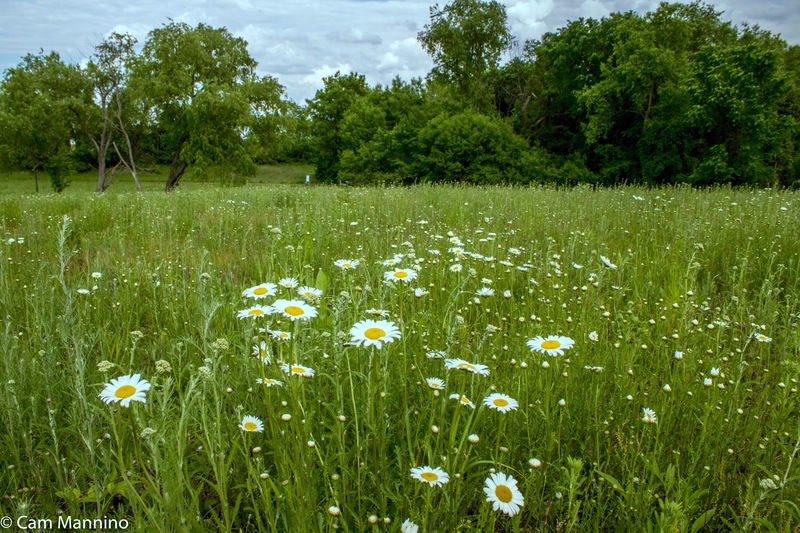 The restoration of the Draper Prairie is beginning to entice some native birds to return, as well as native plants. On a windy day, I spotted my first Savannah Sparrow (Passerculus sandwichensis) swaying on a plant stem in a stiff wind. In fact, the wind knocked him from his perch at one point, like the Viceroy butterfly mentioned above. This small sparrow with yellow over its eye may be seen more often now that restored prairies are providing the native plants that attract the insects it prefers. I couldn’t record its call in the wind, but listen here for its song that has an insect-like buzz in the middle! The Savannah Sparrow is returning to our parks since prairie restoration provides ideal habitat. 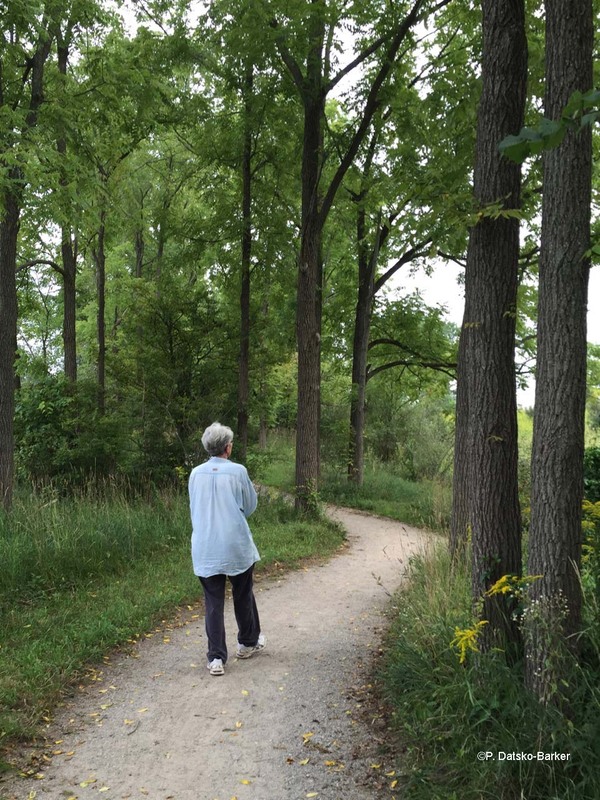 I began my Draper Twin Lake Park visits with a second scolding from a male bird, akin to my escapade with the goose at Lost Lake. I approached the marsh on the eastern side of Draper Park to look at what appeared to be some female Red-winged Blackbirds (Agelaius phoeniceus) among the giant leaves of Fragrant Water Lily. Almost immediately a male blackbird began its alarm call, left its perch in the distance and flew directly toward me. 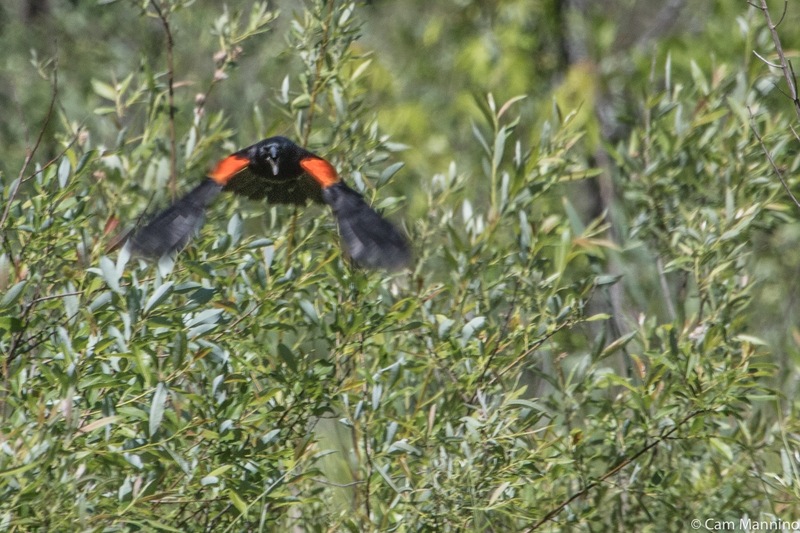 The male Red-winged Blackbird headed toward me when I got too close to his fledglings. He landed in a tree next to me and never stopped expressing his irritation until I moved away. Click below to hear a worried blackbird dad! As soon as I focused my camera’s long lens, I knew why he was upset. Fledgling blackbirds look very much like their mothers. It was clear the birds among the lily pads were his fledglings and he wanted me to back off. And I did, of course! One blackbird fledgling chirped, begging for food from among the lily pads. Fledgling #2 was smaller and just seemed overwhelmed by the world in which it found itself. Another avian dad was a little further along in parenting his offspring. A male House Finch (Haemorhous mexicanus) rested on a vine near the eastern parking area and just below sat one of his offspring on a guy wire, looking straight up at Dad longingly, begging to be fed. Evidently the male thought this was no longer necessary, because no feeding was forthcoming. But the youngster kept looking hopefully upward at its parent. As I strolled through the prairie, I watched a Tree Swallow (Tachycineta bicolor) flying open-mouthed to scoop up food for the young in its nest box. Later I saw some gnats dancing busily above the prairie grass and wondered if the large clouds of them over the prairie were part of the Tree Swallow’s diet. A Tree Swallow forages by flying with its beak open and scooping prey from the sky. I wondered if these quickly dancing gnats were part of its meal! A female House Wren (Troglodytes aedon) seemed to be carefully watching an Eastern Kingbird (Tyrannus tyrannus) flying near what appeared to be her nest box. The Eastern Kingbird can be fiercely territorial about its nest and later I saw it land nearby and look toward the wren’s box. But eventually it flew away. Drama avoided. A wren kept an eye on an Eastern Kingbird flying near its nest. The Kingbird landed and watched the wren’s box for a few moments, but peacefully left. 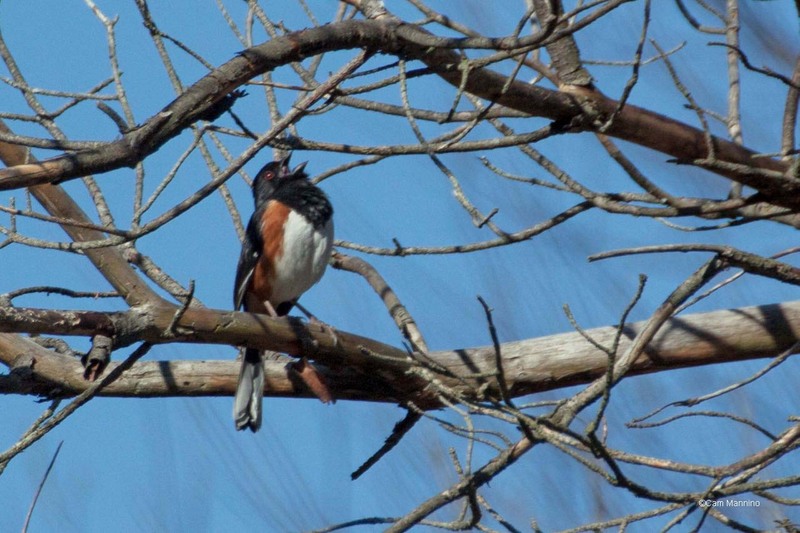 An Eastern Towhee singing “Drink your teeeeeea! In moister regions of the park, other native plants emerge. Scouring Rush (Equisetum arvense), a native fern-ally, produces spores on its cone that look like Indian beadwork. Fragrant Waterlilies (Nymphaea odorata) send up bright yellow club-like buds from the marsh and Wild Columbine (Aquilegia canadensis) dangles its exotic blossoms in the shade. Plants deserve a bit more respect from the creatures, like us, that depend on them. We tend to notice most the animals, birds, insects that have faces like ours, I guess. But of course, all around us plants are doing the amazing work of pulling up minerals and water from the earth, soaking up sunlight from the sky and miraculously turning those elements into the food that fuels all living beings. Directly or indirectly, everything that all of us eat is provided by plants. I feel very lucky that volunteering for Dr. Ben VanderWeide, our natural areas stewardship manager, has taught me to honor a wider scope of nature. Now while I’m fascinated with wildlife, I’m also learning to notice and name the plants, particularly the native wildflowers and grasses, that have performed the miracle of photosynthesis right here for thousands of years. Such a generous gift! Footnote: My sources for information, besides Oakland Township's Stewardship Manager Ben VanderWeide, are as follows: inaturalist.org;Allaboutbirds.org, the website of the Cornell Ornithology Lab at Cornell University; Wikipedia; Herbarium of the University of Michigan at michiganflora.net; various Michigan Field Guides by Stan Tekiela;Butterflies of Michigan Field Guide by Jaret C. Daniels,  A Guide to Bird Behavior Vols.1-3 by Donald W and Lillian Q.Stokes, the passionate enthusiasts at the Facebook groups Odonata of the Eastern U.S.and Butterflying Michigan plus others as cited in the text.